Gospel Time Trekkers series puts tweens in Bible stories! With two avid young readers in the house, I’m constantly looking for good YA novels. The Gospel Time Trekkers series caught my attention recently because the girls like historical fiction. These six novels are about three siblings who travel back to Jesus’ time and experience first-hand the events of the Gospels. Lily liked the Gospel Time Trekkers series because she thinks the books would be good for the whole family, as they help you understand Bible stories. She also liked reading about young kids (her age!) who meet lots of friends. Sunshine thinks its cool how the time trekkers are always figuring things out. She also noted that the siblings’ adventures in the stories are always three days, the same length of time that Jesus was in the tomb. I read Shepherds to the Rescue in about an hour. 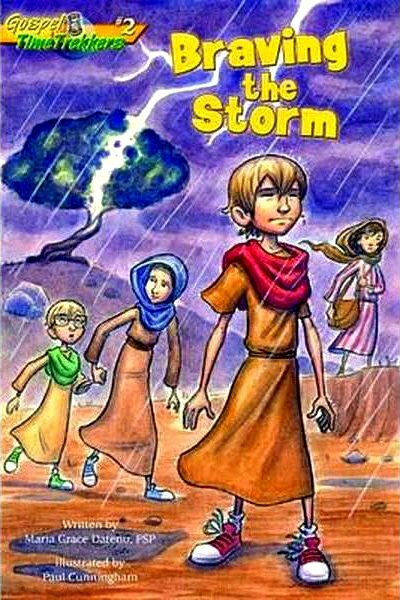 Sister Maria Grace Dateno writes an action-packed, Biblically accurate story. I enjoyed the siblings’ interactions with each other and the descriptions of Biblical places and cultures. As an adult, I could see the lessons woven through the story but my daughters just enjoyed a good story. For example, I’ve raised sheep and heard plenty of lessons about shepherds in Bible times. I still enjoyed reading about a shepherd boy, and hearing him explain to his new friends how and why he does his chores. I’m sure that story will stick with the girls and make them think more about the shepherd stories they hear in the Gospels. The novels are geared toward early readers (ages 6 to 9). The books have short chapters and beautiful black-and-white illustrations to accompany the stories. An avid reader (like Sunshine) can read through the entire series in a couple days, while a beginner reader will enjoy the accomplishment of finishing one book. Sister Maria Grace Dateno grew up in Springfield, Virginia, and has one older brother and four younger sisters (and twenty-two nieces and nephews-so far). She met the Daughters of Saint Paul when she was fifteen years old and felt God calling her to help people know and love him. Since then, Sister Grace has edited a Catholic children’s magazine, authored several children’s books, and now serves as an acquisitions editor for Pauline Books & Media in Boston, MA. The Gospel Time Trekkers series are available in print and ebook from Pauline Media, Amazon, and your favourite Catholic bookseller. I received these books for review courtesy of the publisher; all opinions expressed are my own. This post contains affiliate links; as an Amazon Associate, I earn from qualifying purchases.